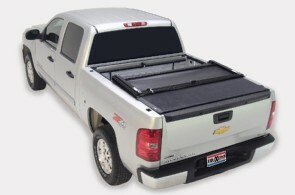 Ultimate access is at your fingertips with the TruXedo Deuce hinged tonneau cover for trucks. 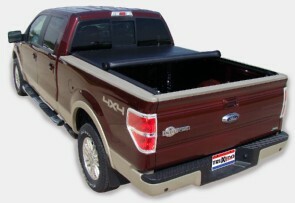 The Deuce features a design unique to the tonneau cover market, rolling up completely to store behind your cab - or unlatching at the header to fold back and allow 21" of access to toolboxes and items stored near the front of the bed. The hinge is constructed in three parts, with the middle piece preventing the cover from creasing when the front section is folded back to keep the tonneau looking great. A pair of security straps hold the cover in place when it is rolled up and stored behind the cab.